UDM Downloads > MyBusinessCatalog Pro! Do you need an electronic catalog to keep up with your customer's demands and to stay ahead of competition? Get MyBusinessCatalog and create your own CD catalogs easily. CD catalogs are easy to send or hand out, they are small, portable, can be quickly replicated, contain more information than their paper "peers", and, if automatic updates feature is present, never get outdated. 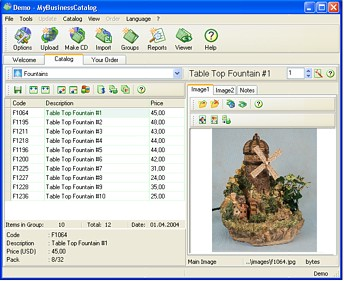 MyBusinessCatalog is a program with wizard-like interface that lets you create your own CD catalogs in a step by step fashion. Simply add product names, descriptions, prices, pictures and other information about your products or services. You can even add your own order form so that your customers can place an order from inside the catalog. After all, the point of having a catalog in not only to show what items you have, but to make sales. Here is the best part of MyBusinessCatalog - it comes with the "smart catalog" feature. It means that you can hand out your CD catalog once and then make any changes to it. After your customers have installed your CD catalog onto their computers, they will have an option to receive automatic updates from you as soon as you make any changes to your catalog, like adding or removing items. So if you run out of something, for example, you can temporarily remove that position from your catalog or add "out of stock" sign, rather then having to deal with angry customers who already made their payments and can not receive their goods. Another great option is an ability to print out catalogs/price-lists from inside CD for folks who don't feel comfortable using CDs or want to take a print copy. Program's low price make this application ideal for small businesses and mom-and-pop shops that run operations on a shoe string budgets. Better yet, MyBusinessCatalog can be download and tried FREE of charge. Get you copy now and watch your business improve.